Last weekend my husband and I hosted a wine tasting party for a handful of friends. Here’s how I kept it healthy and had fun. Birthday parties, happy hours, champagne brunches, and nights out with the girls are all occasions I used to really fear, both during and after my weight loss. I would get caught up in the festivities and always overindulged when I was in good company. I'd then spend the next day feeling miserable and disappointed in myself. After a little trial and error, I've learned that social settings don't have to show up on the scale. Last weekend my husband and I hosted a wine-tasting party for a handful of friends. Here's how I kept it healthy and had fun. When it comes to higher-calorie party food, my rule is this: If I can make it myself, I don't try it if it's not healthy. Everyone chipped in and brought something and when I saw the amazing cornflake cookies my sister made, I knew I had to indulge a little. I stuck with mostly healthy fare—crudités, olives, cheese, and whole-grain crackers. Then I didn't feel bad having a few cornflake cookies! I always prepare a small plate of food for myself instead of snacking all night on appetizers. It provides me with a visual aid of how much I am eating. 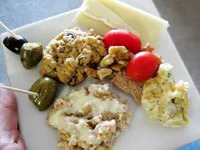 It's easy for me to lose track of small bites here and there—over the course of my wine tasting, I could have easily eaten a bunch of burger bites without even realizing, so my plate system really works for me. I can always go back for a refill if I am still hungry. I take a moment to soak in the atmosphere of the event instead of making a beeline for the bar. I get a feel for the room, preview the food spread and passed appetizers, and take a peak at the cocktail list before selecting anything to eat or drink. I know if I peck at the first plate of food I see, I'm only setting myself up for disaster. Instead I take a moment to figure out what I really want, and ultimately make healthier choices for myself. I like to enjoy a cocktail or two, but once I've had a couple of drinks I find it difficult to turn down a third or fourth glass. And, of course, alcohol also lowers my inhibitions about eating high-calorie foods. Before the night begins, I determine how many cocktails I will have and stick to that number. Toward the end of the evening a bunch of my friends—and my husband too—all cracked open some beers, but I continued to nurse my last glass of wine. Having healthy friends helps, but my pals aren't exactly the picture of perfect eating! I still had a ton of fun at our party and woke up feeling good about my food the next morning. What are your tricks for staying healthy but still enjoying yourself?